Ocean Basket is South Africa's favorite line of seafood restaurant chain. It has more than 190 restaurants around the globe and growing rapidly across several countries. 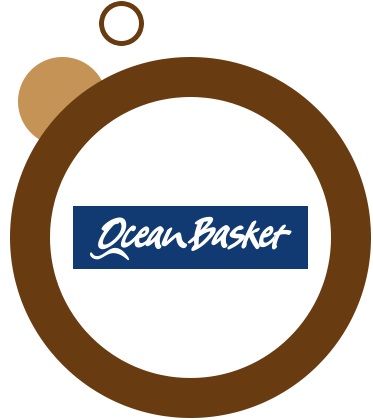 In Ocean Basket, people will experience the joy of eating seafood in a very friendly yet relaxed atmosphere. The menu selection is very wide and full of exquisite seafood cuisines. Be it for lunch or dinner, with family or friends, Ocean Basket is the ultimate choice. First Ocean Basket opened in Menlyn Park and the place soon got very popular. As Ocean Basket team puts it "this phenomenal global expansion in just 17 years is due to an unshakable recipe for success: an exciting menu of top quality seafood with excellent and friendly service". The majority of stores can be found in South Africa with the rest strategically placed throughout the African continent, Mauritius, Europe and Dubai. Apart from other exciting global locations, 2011 also saw the first Ocean Basket opening its doors in the Middle East in Dubai, the shopping capital of the world. The chain has also won several restaurant and cuisine awards in different countries. Ocean Basket exciting and vast menu includes varieties of fish, calamari, prawns, sushi and much more. Alia Plaza, Abu Baker Siddiq St.
King Abdulaziz Road,Exit 5, Ghader Dist. Al Omari Center, Abo Bakr Al Siddiq St.